Photo: Beached boat on Bai Sao. As Long Beach begins to get more and more crowded with people and development, it’s only a matter of time before travellers start looking elsewhere. 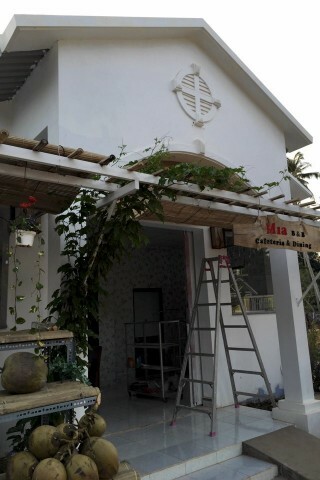 Mia B&B is just the ticket for backpackers and flashpackers looking for budget accommodation within short walking distance of Ong Lang Beach. Not only is this new guesthouse clean and comfortable, guests can expect the most warm and welcoming service from the lovely English-speaking owner – no question or request is too much. And on an island with same-same hotels sprouting up like mushrooms, Mia B&B is savvy by targeting backpackers/independent travellers, currently an underserved market on Ong Lang Beach. Those who prefer self-catering will love the shared outdoor kitchen and dining. Ms Hanh can even go to the market for you to buy fresh veg and seafood. The small private rooms are great. Walls have been jazzed up with wallpaper, the room with a table, chair and a few hooks. There are no frills like TV or fridge, however you do get WiFi, air-con, an electrical outlet conveniently located beside the bed and a hot shower in the ensuite bathroom. They also provide shampoo and shower gel from a dispenser and tiny towels. When we stayed in December 2015, Ms Hanh was putting the finishing touches on the air-con dorm rooms. The two dorms contain eight beds, with an ensuite shared bathroom. The rooms are quite small and cramped, but are a fine place to lay your head down and the price is unbeatable, plus the friendly service is priceless. Mia B&B is located on the same beach access road as Bo Resort and Mango Bay Resort. Follow the sign -- it is only a few metres down from popular Sakura Restaurant. Check rates at Mia B&B on Booking.com.